Irrespective of the phone you are using, if it stops charging or is charging partially, it can be very frustrating. There could be various reasons for the charging problem. In this article, we will focus on why an iPhone sometimes does not charge properly. For all you know it could be a minor and easy to rectify issue. Just go through the Troubleshooting section and try to resolve the issue if it is listed there. Some may advise you to replace the battery, but do not jump to the idea. It is the iPhone software and not the hardware that decides when to charge the phone. If you still think the issue is hardware related, it could be the charging port and not the iPhone battery. All iPhone users know that the iPhone hardware is the best. In this article, we will list out the possible issues that could cause charging problems. The Lightning is an 8-pin connector and the design makes sure that you do not damage the port easily and the cable connector too is resistant to damage. However, the downside of the design is that it invites lint and debris to accumulate, especially if you are used to carrying your phone in your pocket or your handbag regularly. Sometimes even if the port has accumulated lot of dirt, plugging and unplugging multiple times, resolves the issue and the phone starts charging. However, doing so makes the lint and other dirt particles adhere together with the connectors. As a result, the technique of plugging and unplugging too stops working because the cable fails to connect to the iPhone due to the accumulated dirt. So, your next step should be to check the port and clean it thoroughly. To clean the dirt from the charging port, it is good to use a brand new and very soft toothbrush because they are anti-static and non-conductive. With a soft anti-static brush, you can be sure that it will not conduct an electric charge or impair the electronics of your iPhone. Alternatively, if you are willing to lighten your pocket, you can purchase one of the many anti-static brushes available at the Apple store. If you are the patient and diligent kind, you can also use a fresh toothpick because just like the soft new toothbrush this too is non-conductive and with its pointed tip can easily remove the dirt from the port. To use the toothpick, moisten the tip lightly with cleaning alcohol and clean the top and the bottom of the port. You will notice that the dirt sticks to the tip of the toothpick and the port becomes clean. If your iPhone is still not charging after making it squeaky clean, check the Lightening cable for damage. Has it frayed at the ends? If so, you must replace the cable. If the cable damage is not visible, how do you identify that it is the main culprit that is preventing your iPhone to charge normally? If your iPhone is not charging using the wall adapter, then plug your iPhone on your computer’s USB to charge. If it is charging on your computer, then the cable definitely is not faulty. Another simple method is to use your friend or family member’s cable. 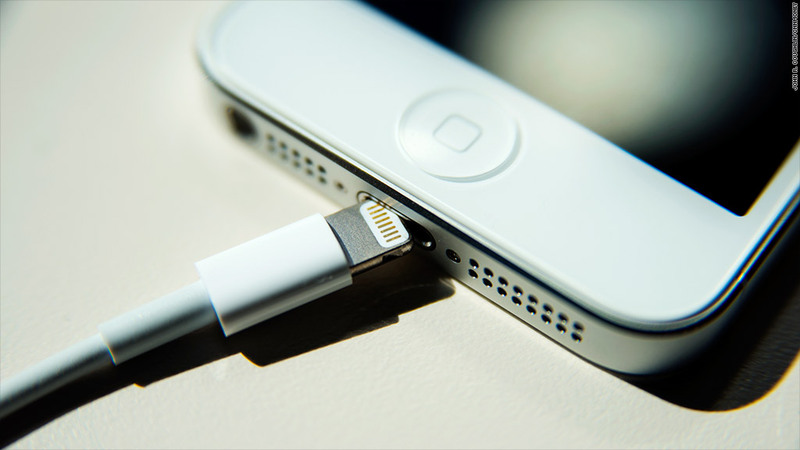 If your iPhone starts charging with their cable, it simply means that your cable is damaged and needs to be replaced. If your iPhone is under warranty, the cable can be replaced for free. TIP: Avoid opting for cheap third party non-Apple cables. However, it does not mean that all non-Apple cables are of poor quality. You need to explore for cables that are easy on your pocket and is of the best quality. You all know that you can charge your iPhone using different ways and means – your laptop, car charger, speaker dock, and other alternate power source. As mentioned earlier in the article, that the software decides to charge or not to charge the iPhone when connected to any accessory. Remember, if the software detects power fluctuations, as a protective measure your iPhone will not charge. So wait until the power is normal and try charging. How do you decide if the iPhone charger is faulty? Apply the same rules for the charger, that you used to check if the cable was faulty or not. Try using a couple of other chargers; if your iPhone starts charging, you need to replace your charger. Try to charge your iPhone with the wall adapter, if it fails try a USB port on your computer and if that too fails then try it with a different charger. If your iPhone does not charge with your adapter but charges fine with your friend’s adapter, it is the right time to get a new charger for self. Always opt for the original Apple charger that you got with your iPhone or a good quality charger that almost meets Apple charger specifications. TIP: If you are using an Apple Keyboard or USB hub, we recommend that you plug your iPhone into your computer’s USB port. USB hubs and keyboards share power across all plugged in devices and therefore may fail to charge the iPhone due to lack of adequate power. Are you sure your iPhone is not water damaged? When you are not sure of the internal damages, the best solution is to visit an authorized Apple store and have it repaired or replaced. Hard reset your iPhone, it may work and your iPhone may start charging. In order to hard reset iPhone 7 or newer just press and hold the power and the volume down button together. If you are using an older version of iPhone press the power and the Home button together till you see the Apple logo and then let go off the buttons. If all of the above solutions fail, you can make a last attempt at DFU Mode and Restore. DFU stands for Device Firmware Update. It is different from the Recovery mode. If you have to opt for this method, do so with utmost caution as there are chances of things going wrong. When you DFU restore, your computer erases and reloads all the code that controls the software and the hardware on your iPhone, so watch out before you jump to DFU! NOTE: If you encounter charging problems with your iPad, you can use the above-mentioned solutions. They work well with the iPads as well. Next time if your iPhone refuses to charge, you know what to do and if everything else fails then visit the nearest authorized Apple service center. However, if we have not mentioned other foolproof solution that you might have tried and succeeded, do share with us.